A visual examination can reveal a lot about your dental health. A trained eye can pinpoint issues such as decay, gum disease, and areas where you could improve your oral hygiene routine. Even the most highly trained expert, though, is limited in what they can spot without the help of extra imaging tools. Dentists used to be stuck using traditional X-ray machines, which transferred images to old-fashioned film. Therefore, it could take some time to develop the images, and the process of taking the x-rays was slow and exposed patients to a significant amount of radiation. 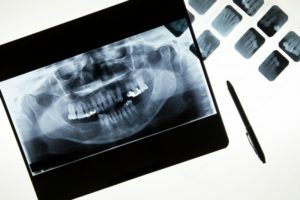 Since the effects of radiation are cumulative over a patient’s lifetime, some people concluded that getting dental X-rays wasn’t worth the risk. Times have changed. Today, most dentists use digital X-ray machines. The process of taking these is fast and simple, and the images go straight to a computer, making it easy for your dentist to get an immediate and in-depth look at what is going on in your mouth. The best part? Digital X-rays expose you to up to 90 percent less radiation than their traditional counterparts. The amount of radiation is so minimal that dental X-rays are safe even for young children and pregnant women. Plus, your dentist won’t take X-rays willy-nilly. The X-ray beam is extremely focused, and you’ll wear a lead apron for protection. Therefore, your exposure to the radiation will be extremely limited. Dental X-rays play an important role in protecting your oral health! The next time your family dentist in Norwood suggests you get one taken, remember that the benefits far outweigh the risks. Dr. John T. Michaels is your friendly, experienced dentist in Norwood. He strongly believes in the power of preventive care, which is why he uses digital X-rays to look after his patients’ health. If it’s time for your next checkup or you have questions about imaging technology, please contact our office at 781-769-6140.